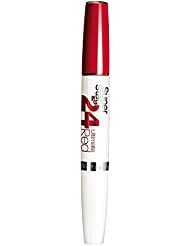 If you're looking for a lipstick with staying power then search no more! This 2 step lip colour is brilliant. 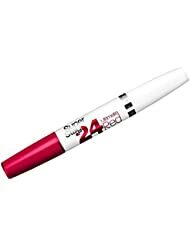 The actual colour goes on smoothly leaving your lips coloured evenly. It is a little tacky for a few seconds but soon dries. Remember not to move your lips around at this stage - so no pouting into the mirror! Then you apply the gloss and get the full impact of this amazing product. Now is the time to pout! Immediately after application I drank a coffee. There was absolutely no unsightly lipstick marks left on the cup. After a couple of hours I had another coffee, the colour remained perfect. I then ate a sandwich. This left me requiring a slight reapplication. So, this lipstick lasted me 6 hours before I had to reapply. 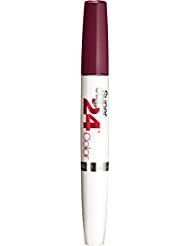 If I was on a night out and only drinking then this lipstick would be perfect as I found it remains in place when drinking but not when eating. This brilliant red lipstick looks natural without looking gaudy or artificial. This has real staying power and probably only needs touching up once a day, in fact its staying power is its unique selling point, continuing to offer great colour for a protracted period of time. It doesn't dry your lips out and doesn't taste horrible either, but simply strong natural colour that doesn't just rub off. So many lipsticks deliver unnatural colours but this Maybelline range are striking without being false and you certainly aren't always refreshing them. I'm a brunette with light olive skin. This is a lovely bright red & it's perfect for evenings in particular. It has a matte, non-drying finish & the texture is not quite velvety but more like a dried lipstick. 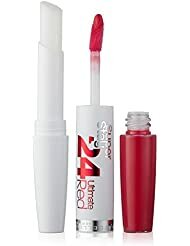 I liked it as I only wear matte lipsticks as I dislike the greasy feel on my lips (although the top coat gives it more moisture but as my lips are not dry & I like the matte finish I don't use it). Also I always forget to really lipstick so this is even better for me. I applied this & it didn't leave any cracks or gaps & went on smoothly. Plus it stayed put without much wearing off for 6-7 hours (a little touch was needed but even without that it looked good). I drank lots of hot drinks & ate food & it didn't affect it. It came off easily when I washed my face in the evening with a face wash. Very nice colour. Last a very long time.